Bring on the fireworks because winter is coming and that means cold, cold and more cold. 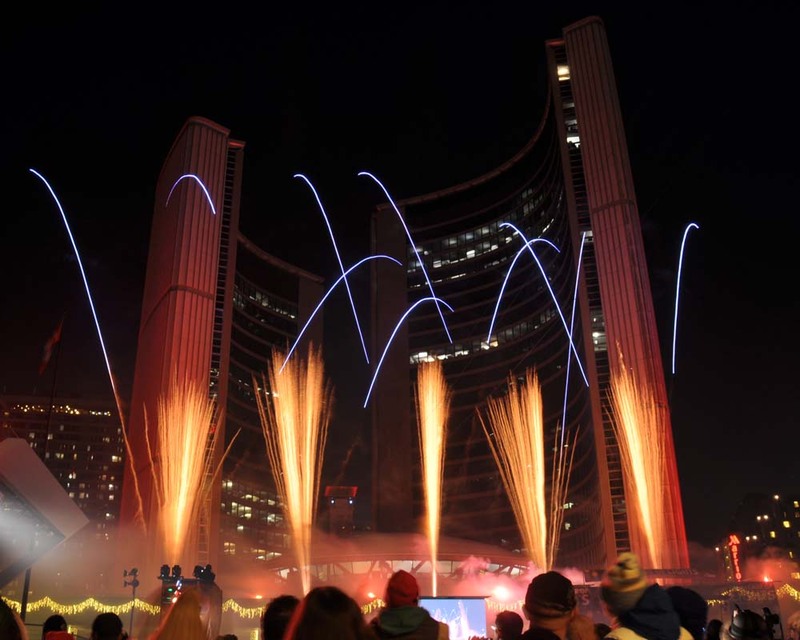 Great Gulf presents the annual Cavalcade of Lights at Nathan Phillips Square on Saturday, November 24th starting at 6pm and winding down at 10pm. This is the also the night for the first lighting of the humongous and official Toronto Christmas tree, DJ skating parties and entertainment from Illuminair. The light rain is supposed to end around 8pm and the temperatures above freezing are welcome from previous years. Actually it never really stopped raining - darn you weather person. One difference for 2018 is that they have closed off the elevated walkway. 6 p.m. – A skating party with DJ Sean Sax, sponsored by Tim Hortons, spinning hip hop and funk classics. This veteran DJ has been a prominent figure in Toronto's Black music scene for over 25 years. 6:50 p.m. – Tanika Charles, Polaris Music Prize and 2017 Juno R&B/Soul Recording of the Year-nominee, a staple in the Canadian soul scene, will take the stage. 7:40 p.m. – Tami Neilson, known for her powerhouse vocals and soulful voice straight from the golden age of country and rockabilly music, will perform. 8:25 p.m. – Illuminair, Toronto's acclaimed circus company, with provide breathtaking entertainment using fire and light. 8:35 pm – Fireworks display. 8:40 p.m. – Kobo Town, Toronto favourites and 2018 Juno Award World Music Album of the Year-winner presents their distinct calypso-inspired sound mixed with dancehall reggae and trombone-heavy brass, sponsored by Great Gulf. 9:40 p.m. – A skating party with DJ Dre Ngozi, sponsored by Tim Hortons. Dre Ngozi's work is fueled by a mash-up of sounds, a true reflection of her nomadic spirit.